This beauty is by Bryan Riolo, aka Algoroth on DeviantART, who also let me use his giant space Cthulhu for my Collect Call of Cthulhu over on Echo Station 5-7. Update: and here, belatedly, is a link to the piece on DA, with Bryan’s thoughts on it. I love the sense of scale here, with paralititans striding through the surf, the chiaroscuro, and the sheer amount of stuff going on. It reminds me of William Stout’s murals, and lots of atmospheric classic paintings. Sure, there’s a theropod getting his guts rearranged, which I’m always up for, but that’s literally just a sidelight (or sidedark?) in this epic image. 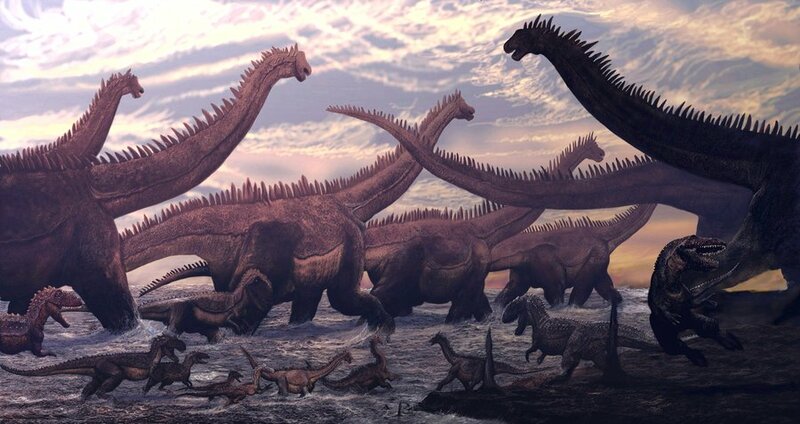 In short, I’m diggin’ the art in this paleoart. That is some seriously great work right there. Excellent lighting and mood, interesting subject and setting on the beach, and plenty of action. Quite. As I said of it on Facebook just now, this is what I come to paleoart for. also i like his artist statement. doesn’t get too hung up on species/stratigraphic ranges. dude wanted to draw THIS and he did some research to make sure he at got the anatomy as right as possible.